Let’s talk shower heads for a minute. Those of you who live in an RV know that water conservation is super important (and it should be in a home as well). Standard shower heads just won’t cut it if you’re trying to get a quick shower AND save water at the same time. 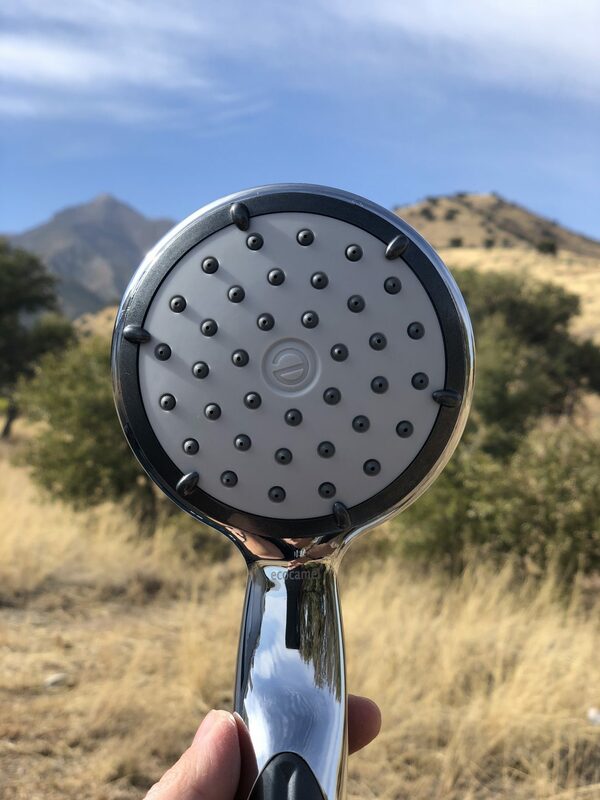 For RVers, there are several companies that offer great water saving shower heads. Most of them mix air into the waterline so that you have greater pressure while using less water. In our 5th wheel we used an Oxygenics shower head. While the water pressure was great, it had it's faults, too. It had a shut off valve on the wand that I both loved and hated. It was nice to shut off the water while holding the shower head, but once you started the water again you were blasted by scalding water for a second. Plus, ours broke within a few months, so we bought another one and the shut off valve broke on the second one within a few months as well. Also, the hose it came with was awkwardly stiff and didn't allow it to hang up quite right. When building out the Airstream, we wanted to try something different. We decided to try out the Jetstorm Handheld by Ecocamel. The water pressure is great and it has a much wider spray compared to the Oxygenics shower head. PLUS, we have used it over 10 months and it has not broken! The hose is far superior to that of the Oxyegenics, too. We love our Jetstorm! If you'd like one, too you can grab one on Amazon.